Harry Dobson was a coalminer from the Rhondda Valley. Dobson worked at the Blaenclydach Colliery. A strong trade unionist he was a member of the National Union of Mineworkers and the Communist Party of Great Britain (CPGB). Dobson was involved in the campaign against fascism. In his autobiography, My Generation (1972) Will Paynter describes a demonstration against Oswald Mosley and the British Union of Fascists in Tonypandy: "I can recall a visit by a henchman of Mosley named Moran, who came with his van to Tonypandy. There was a spontaneous massing of people as soon as he arrived and he was forced to leave, but not before the angry crowd did battle with this blackshirt troop. Some thirty-six Rhondda men and women were sent for trial, many of them receiving gaol sentences, including a very close friend of mine, Harry Dobson." At its Congress in February 1937, the South Wales District of the Communist Party of Great Britain stated: "This Congress sends its greetings to the remaining Taff Merthyr prisoner, Will Richards and to our comrades of the Rhondda, Harry Dobson, Sam Paddock and Arthur Griffiths who are imprisoned for their anti-Fascist activities." The Communist Party of Great Britain supported the Popular Front government during the Spanish Civil War. The idea of an international force of volunteers to fight for the Republic was initiated by Maurice Thorez, the French Communist Party leader. Joseph Stalin agreed and in September 1936 the Comintern began organising the formation of International Brigades. An international recruiting centre was set up in Paris and a training base at Albercete in Spain. Dobson, who was unemployed at the time, decided he would join the British Battalion. Dobson avoided the French-Spanish border by sailing from Marseilles to Barcelona. However, the ship he was travelling in was torpedoed in June 1937. Some of the men drowned but Dobson was able to reach land and eventually joined up with the International Brigade in Spain. Will Paynter, who also fought for the Popular Front government, described Dobson as "quiet and unassuming but a great comrade." In his book Miners Against Fascism (1984), Hywel Francis adds that "Harry Dobson of Mid-Rhondda who, amongst the Welshmen, best combined the qualities of courage under fire, coolness and shrewdness in leadership with a profound political understanding." Dobson joined up with the British Battalion in June 1937 and he went straight into action at Brunete, where he was wounded. After returning to the front-line he replaced Wally Tapsell as battalion commissar. He took part in the battles on the Aragón front in September and October, and was then sent to the Officers' Training School in Tarazona. In January 1938 he was promoted sergeant and rejoined the battalion towards the end of the Teruel campaign. Dobson took part in the fighting at Huesca, Gandesa and Ebro. 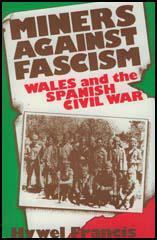 The author of Wales and the Spanish Civil War (2004) points out: "Many incidents of the bloody and prolonged encounter between the English-speaking battalions and the 6th Bandera of the Spanish Foreign Legion, an elite Nationalist unit which was well dug in to the key pinnacles, have passed into legend. The hill was attacked repeatedly for four or five days, incurring severe losses, and all in vain. At the first onslaught, Dobson was badly wounded in the upper abdomen and fell alongside Morris Davies (Treharris). Both men sustained their injuries whilst attacking enemy positions without thought of their own safety, an action which deserves to be regarded as heroic. It was an advanced and exposed position and only one stretcher party was in the vicinity. The bearers chose to take Davies, whose wound was more immediately life-threatening. Dobson lay helpless and in agony within the fire field for some time before being rescued." Morris Davies later recalled: "I was given orders to capture a ridge. As I advanced with six other men we were peppered with enemy fire. We would not have achieved our objective had not Harry Dobson of the Rhondda given us cover-fire. Harry and I were caught by shrapnel. He insisted that his wound was not as bad as mine and... that I should be taken back on a stretcher first." Reginald Saxton while receiving support from Leah Manning. As there was only one available stretcher it was sometime before he was eventually taken back to base camp. Nan Green, Patience Darton and Leah Manning were all involved in nursing Dobson when he was wounded at the Battle of the Ebro. 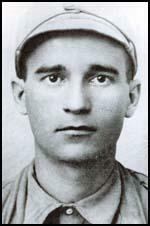 Green later recalled Manning holding his hand until he died. Manning later described what happened: "Patience (Darton) was just coming on duty for the night and as we went into the cave, the stretcher bearers brought in an English comrade from the British Battalion who was gravely wounded in the abdomen. He had had his spleen removed and Reggie Saxton had given him a blood transfusion. As I stood by he opened his eyes and spoke my name. I recognised him as a comrade whom I had met at a by-election in South Wales, a miner from Tonypandy named Harry Dobson. Dr. Jolly told me that it was not possible that he could live in fact they thought only a few hours, so I determined to stay by him until the end. Actually, it was fifteen hours before he passed away but I did not leave him during that time and he seemed very happy to have me there." Harry Dobson died on 28th July 1938. During the battle of Ebro the Nationalist Army had 6,500 killed and nearly 30,000 wounded. These were the worst casualties of the war but it finally destroyed the Republican Army as a fighting force. I can recall a visit by a henchman of Mosley named Moran, who came with his van to Tonypandy. There was a spontaneous massing of people as soon as he arrived and he was forced to leave, but not before the angry crowd did battle with this blackshirt troop. Some thirty-six Rhondda men and women were sent for trial, many of them receiving gaol sentences, including a very close friend of mine, Harry Dobson. This Congress sends its greetings to the remaining Taff Merthyr prisoner, Will Richards and to our comrades of the Rhondda, Harry Dobson, Sam Paddock and Arthur Griffiths who are imprisoned for their anti-Fascist activities. One of the comrades whom Griffiths relied on for advice and information was Harry Dobson. Indeed, Dobson and Griffiths acting together seem at times to have reached decision (or at least reconirnendations) upon the fates of fellow volunteers, up to and including that of "execution". It could be argued that Dobson had acquired sonic moral authority for such a role, since he was the most unambiguous example of a Welsh warrior hero produced by "Spain". He was already an authentic veteran by the time Griffiths arrived in the battalion. It was Dobson who allegedly posed the resonant question upon release from gaol - after serving a sentence for riotous objection to a fascist meeting in Tonypandy - "How do I get to Spain?" Whether or not they picked up this announcement, the fascists seemed to know Dobson was coming. Appropriately enough, Harry's war began even before he got to Spain, since he was among the survivors after the troop-ship Ciudad de Barcelona was torpedoed by an Italian submarine. Arriving at the battalion in June 1937, Dobson went straight into action at Brunete, where he was wounded. After recovery he succeeded Tapsell as battalion commissar. He took part in the battles on the Aragon front in September-0ctober, and was then sent to the Officers' Training School in Tarazona. Early in 1938 he was promoted sergeant and rejoined the battalion towards the end of the Teruel campaign. During the retreats of March he was captured, along with his whole platoon. Somehow they escaped their captors' clutches and, by travelling at night across country, safely regained the Republican lines. Dobson later - doubtless mainly in obedience to orders - published an account of the exploit which lacks credibility in detail, but may have served its morale-boosting purpose in encouraging the others. Shortly after the Ebro offensive began, the XV Brigade was engaged in the siege of enemy positions in the hills overlooking the town of Gandesa. Divisional commander, General Walter, estimated that Gandesa's capture was essential to the further progress of the whole offensive; in turn, his staff decided that this success depended on the taking of the nearby summits, in particular the peak numbered "Hill 487". Many incidents of the bloody and prolonged encounter between the English-speaking battalions and the 6th Bandera of the Spanish Foreign Legion, an elite Nationalist unit which was well dug in to the key pinnacles, have passed into legend. The hill was attacked repeatedly for four or five days, incurring severe losses, and all in vain. At the first onslaught, Dobson was badly wounded in the upper abdomen and fell alongside Morris Davies (Treharris). Both men sustained their injuries whilst attacking enemy positions without thought of their own safety, an action which deserves to be regarded as heroic. It was an advanced and exposed position and only one stretcher party was in the vicinity. The bearers chose to take Davies, whose wound was more immediately life-threatening. Dobson lay helpless and in agony within the firefield for some time before being rescued. 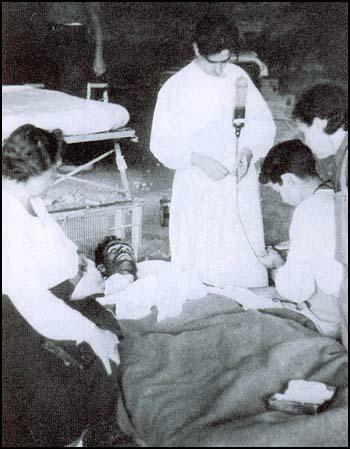 Eventually he was carried to Brigade HQ, a few kilometres away, in a complex of hillside caves near La Bisbal de Falset Here a field medical team operated on him. Despite his sedated condition, Dobson later spotted and recognized Leah Manning, ex-MP for the Labour Party and Hon. Sec. of the Spanish Medical Aid Committee, whom he had heard speaking during the very antifascist rally at which he had been arrested. The surgeon, Reg Saxton, told Manning that Dobson could only last a few hours. At some point it was decided to give the patient a blood transfusion, even though his spleen had been destroyed and recovery was impossible. This technique was still a new one, adapted by Saxton from a patent system made famous by the Canadian, Dr Bethune. In a letter to a Welsh coinrade, Manning later remarked that I may be able to send you a photograph taken of him in bed. We wanted to have a photograph of someone having a transfusion, for propaganda in this countrv. In fact, perhaps as a result of this decision, Dobson survived for fourteen hours rather than the two predicted. Manning staved at his side for most of this period and Dobson asked her to hold his hand. His last words were carefully chosen in order to emphasize the "Unity" between his own party and that of the Labour MP. "Comrade" - he said - "they will never keep back the progressive cause." Harry Dobson of Mid-Rhondda who, amongst the Welshmen, best combined the qualities of courage under fire, coolness and shrewdness in leadership with a profound political understanding.... He served with distinction at Brunete, Quinto, Belchite, Mediana, Huesca, Teruel, Caspe and Grandesa. On one occasion he succeeded in escaping from captivity. Finally, having become a Political Commissar of the Major Attlee Company, he took part in the Ebo offensive during which he was fatally wounded on 28 July 1938. The most important military experience for me was the Ebro offensive in the Summer of 1938. 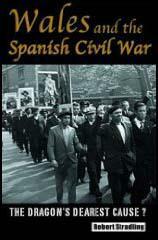 It was the biggest and last action for the International Brigades... I was given orders to capture a ridge. As I advanced with six other men we were peppered with enemy fire. We would not have achieved our objective had not Harry Dobson of the Rhondda given us cover-fire. Harry and I were caught by shrapnel. He insisted that his wound was not as bad as mine and... that I should be taken back on a stretcher first. I was taken back across the river to Cherte. Harry was removed later but he died. I suppose that in all the history of modern warfare there has never been such a hospital. It is the safest place in Spain, beautifully wired for electric lights and with every kind of modern equipment. This hospital is evacuated twice a day. It is tragic to add that a large proportion of the evacuations are by death, because only the gravest cases are brought here from the front, and the only ones who remain for longer than the first day or two are abdominals and serious amputations. Patience Darton and Ada Hodson were working there when we arrived. Patience was just coming on duty for the night and as we went into the cave, the stretcher bearers brought in an English comrade from the British Battalion who was gravely wounded in the abdomen. He had had his spleen removed and Reggie Saxton had given him a blood transfusion. As I stood by he opened his eyes and spoke my name. I recognised him as a comrade whom I had met at a by-election in South Wales, a miner from Tonypandy named Harry Dobson. Dr. Jolly told me that it was not possible that he could live in fact they thought only a few hours, so I determined to stay by him until the end. Actually, it was fifteen hours before he passed away but I did not leave him during that time and he seemed very happy to have me there.